Welcome to our online resource library. 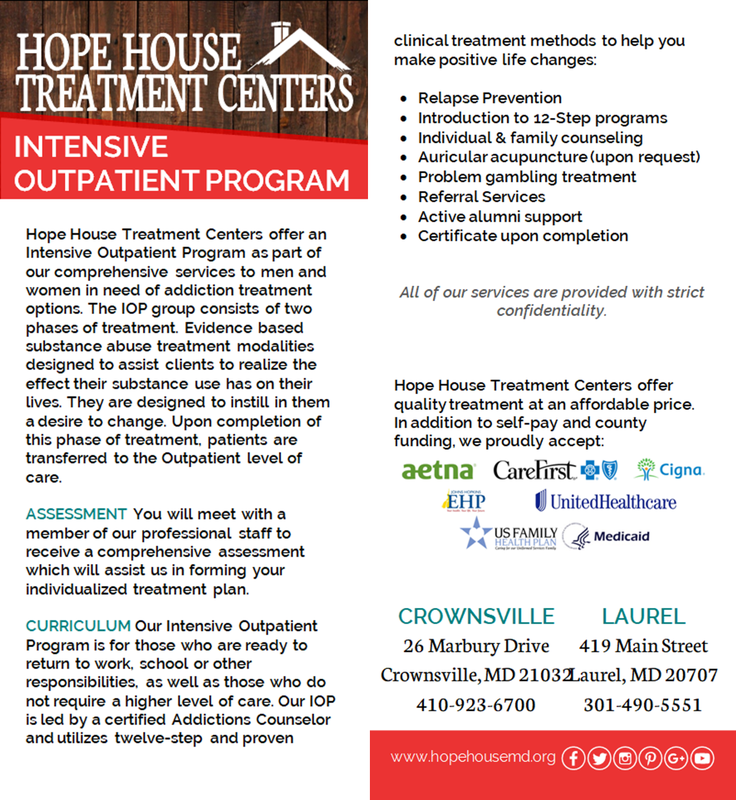 Please feel free to browse through our collection of community resources and handouts available at exhibitions, in the local medical community, and at our treatment centers. If you are a medical or media professional and would like to request a media kit or other print materials, please contact us at subscribe@hopehousemd.org. The Crisis Response System known as the "Community Warmline" is a service that provides Anne Arundel County Residents in crisis with supportive assistance and links them to resources in the community. To utilize this service, please call 410-768-5522. The warmline can receive calls 24/7. For more information, please visit the Crisis Response System's website. Maryland's Prince George's County Crisis Hotline can be reached at 301-429-2185. This hotline is provided by Affiliate Sante Group which prides itself in offering comprehensive crisis services to anyone in the community that is experiencing a mental health crisis. They offer emergency psychological assessment and intervention services to individuals, families and communities impacted by a crisis event. For a list of crisis services in surrounding counties, please click here. As of April 20, 2017, every fire department and police station in Anne Arundel County and Annapolis are designated as a safe environment for anyone seeking assistance with their path to recovery from heroin and opioid addiction. For more information, please visit the Safe Stations' website. According to Maryland Law, if you help someone in good faith who is in need of medical assistance from a drug or alcohol medical emergency, you and the person you help are immune from criminal prosecution (Md. Ann. Code Art. CR § 1-120). For more information, please click here. On June 1, 2017, Dr. Howard Haft, DHMH Deputy Secretary for Public Health Services, issued a new statewide standing order allowing Maryland-licensed pharmacists to dispense Naloxone to anyone who may be at risk for opioid overdose or in a position to assist someone believed to be experiencing opioid overdose. A person specific paper/electronic prescription is not required for a pharmacist to dispense Naloxone under the standing order. For more information, please visit the Maryland Behavioral Health Administration's webpage. For a list of current opioid overdose response training events in Anne Arundel County, please visit the Anne Arundel County Department of Health's Adult Addiction Program's website.